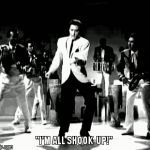 Elvis Presley is all shook-up! Interesting! The longer I look at this, the more he just looks like a dork with a wedgie!